Raf Antonio uses the form of photography to capture a realistic x romantic image of self. In western art history, Realism comes to trend in France in the early 18th century. It brought the idea that the ‘grotesque’ and non-courtly way of life could be objects in portraiture and painting. It was a rejection of Romanticism, which realist criticised to be over-exaggerated and falsely-depicted a better reality. Antonio creates a blend of both romanticism and realism in his depiction of self. Painting himself in colours with light, costume and make-up he emphasises a self-love that is celebratory and caring. Antonio revives Romanticism for its ability to emphasise and make heroic real people. The political movement for which it was rejected in Past France, romanticism has been reinvented for a necessary depiction of contemporary people. a less-Eurocentric Latin American beauty that I feel doesn’t get seen enough”. for Panther Daze Designs, a new independent lingerie company. Raf Antonio (2017), 3 stills from collection. Antonio puts on the pedestal everyday objects close to his personal history and past. His technique is subversive, reinventing the meaning of icons through exposure to personal histories. Contextualising or consuming Antonio’s work involves looking at several pieces in different forms, and that would be the experience. Seeing one thing and the next allowing the space between to think, process or reflect. Raf Antonio (Dec 2017), webpage detail. Raf Antonio makes public his experience growing up through a series of essays titled ESS-HAAAAAYS! Antonio has opened up his perspective to you. His work unique and his voice unique, reading each essay enables the ability to piece together the psyche behind the work and why each one is important to Antonio. Personal context allows a directed experience, it changes what a viewer processes when consuming one piece of work to the next. Rope Running Out is Raf Antonio’s larger narrative work. A delicately woven poetic tale with characters based on people in Antonio’s own life. Original poster for Rope Running Out, 2017, designed by Raf Antonio. The story begins with Nacio who instinctively takes a photo of Lobo as he enters a café. They make eye contact, holding it. Nacio shows the photo to Felix his partner, and you learn their relationship is not physically but cerebrally sexual. Words. The characters don’t speak as much as they say words and words are given their importance. Colour, the ‘shortcut to emotions’ Antonio tells me. Posturing, the characters placement in correspondence to the others. The overall feeling while reading the play is romantic, oh so romantic. And in this way makes powerful and beautiful three queer men. Raf Antonio’s narrative writing puts characters on a pedestal. Rope Running Out subversively portrays queer men successful in creating strong relationships and strong in helping each other through their traumas. Taking a step back, looking at the timeline of queer stories on stage, few plays or films portray strong queer men. Rather the common portrayal shows suffering that ends in suicide or death. Antonio makes a decision to give a commonplace trope a nudge in another direction. When we take the queer identities out of the character the piece is the romantic narrative we’ve all heard before. A love triangle. An idea of audience is conceived in Antonio’s work. What do queer identifying folk see in the work about their lives? It is apparent, queer folks living in our dominating hetero-normative society is challenging and for some dangerous. And to portray and exemplify them in an ultra-realistic portrayal is as if to accept it. So changing it means hope and change point blank. Raf Antonio spoke to me about “personal propaganda”, which he learned of after watching a recording of Jill Soloway’s Master Class on The Female Gaze at the Toronto International Film Festival (TIFF). 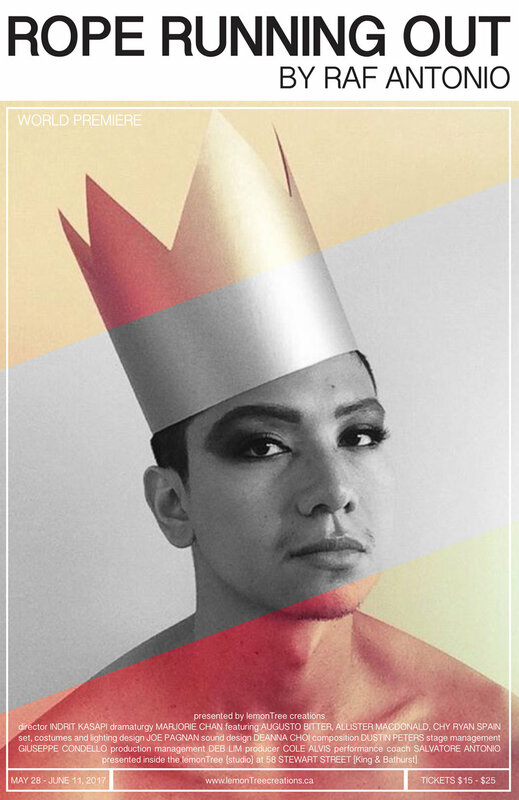 Antonio was inspired to work from his own perspective as a queer person of colour. “Personal propaganda” being an art form that shares a person’s world view generating greater empathy in the dominant culture, hopefully, creating a safER space to exist. Raf Antonio cites influence from Peter Hujar, Zanele Muholi, Luke Austin, Robert Mapplethorpe, and Quinnford & Scout. Learning from them perspective in photography. A portrait can be a small intimate detail framed to give distance. The self-portrait series expands on the personal propaganda nature of Rope Running Out. Antonio practices the artist’s body as subject. He embodies his self, and documents it. Raf Antonio (2017), still from collection. If narrative and drama is moving image, Antonio’s photography project lets the narrative pause so we can investigate a single image and character. Investigation in real time that is. Raf Antonio (2017), 6 stills from collection. Distance and detail all at once. Antonio inter-splices highly arranged images with images from his daily life. It creates a narrative of his life as he lives it. Raf Antonio (JUN 2017), 6 stills, Instagram screengrab. Choosing to present the self-portrait series on a social media platform, it is in part a community project to liberate Latinx masculinity to a contemporary context as well as a personal exploration. Amongst writers there is a saying ‘there’s only 7 types of stories to tell’, but there is still a point to telling stories because of the individual background and personal history of each writer. The way each writer tells the story will be different than any other. Raf Antonio’s work is representative of this, self-validating, empowering, emotional and especially demystifying. With a focus on the character and portrayal of queer latinx people Raf Antonio presents himself and turns tropes and generalisations on its head. Further exploring! Raf Antonio’s Instagram (@raflareine) is where you can track his process and see new pieces in his Self Portrait Project. And look to the sky for Raf’s next work THE EFFEMINATES: A Queer Tale of Bloody Vengeance. The piece is currently in development with Cahoots Theatre Projects in Toronto. Toronto is where Raf Antonio is based and active. Contact Raf Antonio, click here.